Dark circles are the worst thing a woman’s beauty care can face, these bluish black indentations under the eye can make you look tired. You look older because of the bags under the eyes. Dark circles are a sign of lack of sleep or tiredness. It could also be a natural sign of ageing or pigmentation. The under-eye area is very delicate and has very thin skin. Ageing can cause the skin to dry and cause dark circles. The apparently cosmetic issue can have an underlying health issue too. Check for hormonal imbalances and deficiencies in your diet too. Have you been following a fad diet or skipping meals? Check for iron deficiency with a simple blood test. Once you rule out the health issues, you can work on removing the dark circles permanently. Do you think possible to remove dark circles in two days flat? Many promises are made but in reality, it is next to impossible to do so, unless it is a temporary issue with lack of sleep. Anti-allergy medication can also alleviate dark circles if the problem is due to allergies. But other than that puffy eyes are treatable with cold green tea bags used as compresses. That is if the problem has arisen because of the excess partying you have been doing the last night! Use apple cider vinegar to get rid of those unwanted marks. Yes, Apple cider vinegar works its charm on dark circle removal too. Just carefully apply with a cotton bud and let it dry. Once the vinegar is dry, wash it off with cool water. Do be careful that the vinegar if it splashes in your eye. Wash with plenty of water. Some under eye creams like ‘Dr. Brandt Needles No More No Baggage’ is a sure fire to provide you with dewy eyes in a matter of minutes. The effects last up to 6 hours. This temporary non-surgical cream can be a lifesaver if you are being dressed as a bride who enjoyed her last bachelor night a bit too much! Tear trough filling surgery is minimally invasive, and takes hardly 10 minutes. This procedure evens out the under eye area, fills deep crevices and makes you look good. Unfortunately, the dark circles may take a week or so to disappear completely. The other way to remove dark circles immediately is the clever use of makeup. How to remove dark circles under eyes naturally in one week? If your dark circles are not chronic or health issue related it may be possible to get free of the unsightly marks in a week or so. There are a few easy things that may help you. But, you need to be diligent about the regimen to get good results. I often end up looking at Facebook late at night and forget to do the look after my skin. The effectiveness of almond oil for dark circles is known since ancient times. This completely natural oil is often used to combat dryness. The sweet almond oil can be mixed with Vitamin E oil or used alone. Massage the oil lightly under your eyes just before sleeping. Keep overnight. Wash it with tap water in the morning. Repeat till the dark circles are history! It’s not a bad idea to continue the treatment as a preventive measure even after the dark circles are gone. Use the sweet almond oil for the eye area, the bitter one is used for Aromatherapy. Ingesting the oil in small quantities with milk is also known to keep skin looking young and healthy. Cucumber has an astringent and skin lightening property that helps fix raccoon eyes for good. Thick slices placed on the eyes cool the skin, remove puffiness and lighten the pigmentation. You can do the process twice daily for a week for best results. Eat the rest of the cucumber for a mild diuretic effect that gets rid of internal inflammation and excess body heat. If the eyes look puffy and dark, use already steeped tea bags to soothe them. Refrigerate the tea bags. Green tea is a better option than black tea. The caffeine in the tea reduces puffiness and shrinks inflames blood vessels around the eyes. Use them twice a day for a week to see good effects. Always remember to wash the tea residue off after a while. The green tea is a natural antioxidant that keeps you healthy and you can kill two birds with one stone. Mint leaves contain menthol and are of more use than just making Mojitos! The menthol improves circulation and reduces the dark tint around your eyes making them sparkly and bright. Just crush and apply. Wash away after about 10 minutes. They smell good too and you will feel fresh for hours. It is the best pick me up before a party. For severe dark circles add fresh turmeric to the mix and use in the same way. This might take 2-3 weeks to show results in deep circles. Milk is an unlikely partner in crime, but is an excellent remedy for dark circles. The Vitamin B12 present in milk reduces dark patches around the eyes naturally. The selenium in the dairy product provides sun protection too. Just soak cotton pads in cold milk and apply on your eyes. Leave on for twenty minutes and wash off. You can do this easy process thrice in the week to get lighter skin around your eyes. This really helps people who wear spectacles and suffer tanning around the eyes. Aloe Vera gel is also extremely soothing and anti-inflammatory. Just apply the pulp to clean under eye area. If you are comfortable, and find it non-sticky you can leave it on for best results. It’s quite easy to grow your own aloe vera at home, and you can use for your hair and skin too! Some species of aloe vera are edible and extremely rich in antioxidants. If fresh aloe vera is not available use bottled gel. Are you blessed with sensitive skin? Add rose water to your beauty care regimen. Just dab on around the eyes and cover with soaked rose water pads for about 20 minutes. You will not only look radiant but also smell divine! Potatoes are not the health villains they are made out to be. Just grate a potato and pat onto your eyes and see the magic. The mild bleaching agent in these tubers will slowly turn your eyes clear and bright. You can also juice them, soak cotton pads and use that. Argan Oil is yet another great under eye brightener. Just apply gently, massage clock-wise and leave overnight. The tocopherols in the oil clear fine lines and wrinkles too. So extend to the whole face if you need it! Tomato juice is another natural bleaching agent. Since it can be harsh on the thin under eye skin, add a little gram flour to it and apply thickly for about 15 minutes. The skin will start looking cleaner in about a week. Continue using till you get rid of the blemishes completely. It is not difficult to remove dark circles permanently. Just keep following all the steps that have been discussed above. It is mandatory to follow a healthy lifestyle, eat well and exercise. The under eye skin is also affected by heredity and hormones. It is equally important to see a doctor to rule out these causes or treat them if a problem is found. Drink plenty of water as even mild dehydration can deepen the dark circles. Drinking less water can aggravate water retention and puffiness around the eyes. Stress and anxiety may also make you look like a raccoon. Try to keep stress at bay. Meditate and cultivate a hobby to keep yourself occupied and happy. These measures help not only with dark circles but boost overall health too. Regular facials and under eye treatments keep your skin supple and healthy too. So no more excuses, head for your favorite Salon at the earliest and pamper yourself. There are many beauticians and dermatologists who swear by caffeine based under eye creams that are the rage today. Caffeine is a natural skin tightener and lightener. The Coffee Bean caffeine eye cream comprises of 100% organic and pure coffee bean caffeine. The other magic ingredients are potent anti-ageing Vitamins, rosehip oil and anti-oxidants. The cream saw an astounding 97% people report a significant reduction in dark circles and puffiness with continuous use. The fine lines and wrinkles also decreased noticeably. This makes it a miracle cream, organic and natural in one. It’s available at all leading stores and on E-commerce sites like Amazon. The tiny tube lasts you a long time as just a few dots are needed. This simple product is the perfect eye cream and you can never go wrong with a natural product. Remember some basic things like not to rub the area hard as the skin is very thin. Pushing and pulling at the sensitive skin will only add to the damage. Go natural, treat the area with care. Use sunglasses to minimize the sun damage to the delicate under eye skin. Be happy, eat right, stay hydrated and just see the jaws drop when you look ten years younger in a short time! 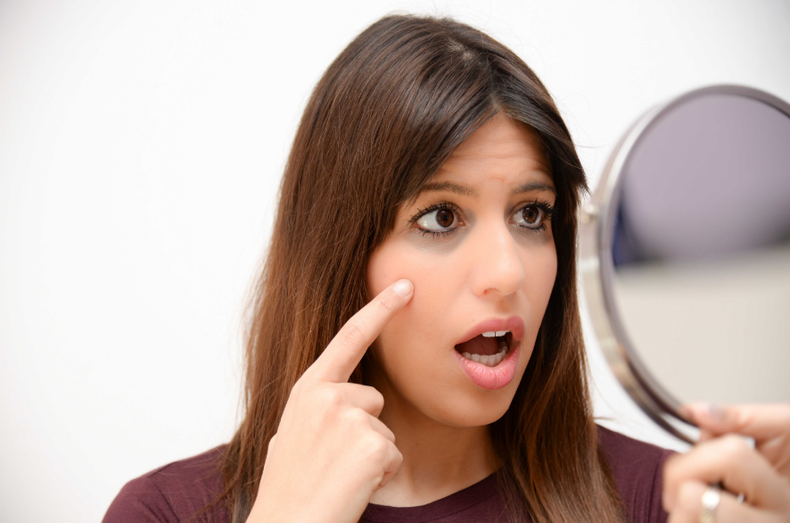 Even you will love your glowing face in the mirror every morning! Wow... thank you very much. I wear spects and don't feel comfortable because of dark circles. Very useful information thank you..